James McBride writes in such a way that you feel like you know Mrs. McBride personally; as though she was your next door neighbor. Mrs. McBride raises 12 kids; all of which go to college and finish college (Ruth earned a college degree when she was 65). She was married twice; both to black men. Rev. 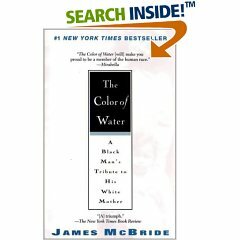 McBride, one of the husbands, named James when he was on his death bed (Ruth McBride was pregnant with James when Rev. McBride died of lung cancer.) This fitting and wonderful tribute to Ruth McBride made me laugh out loud and it also made me cry (the subtitle to the book is ‘A Black Man’s Tribute to His White Mother’). All in all, Ruth McBride gives credit to God for helping her when funds, resources, and living arrangements were less than idea or optimal. She said this about God, “I want you to know you are looking at a witness of God’s word. It’s real. It’s real.” This book is a must read! sounds like a good one. maybe i can borrow it from you when we get back.